Originally built over 130 years ago, our barn has been renovated inside and out while keeping with the original rustic look and feel. 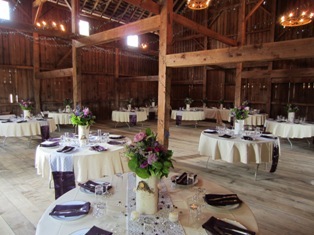 We are one of the Willamette valley's only true historic barn venues available for weddings and other events. 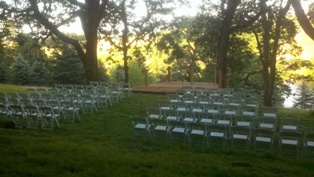 We specialize in smaller events and due to space and safety requirements we limit the maximum number of guests to 120. We rent the barn from May to Oct. only. No venue restrictions on catering or alcohol, you may use whoever you like or do it yourself. Use of large collection of rustic themed decorations. 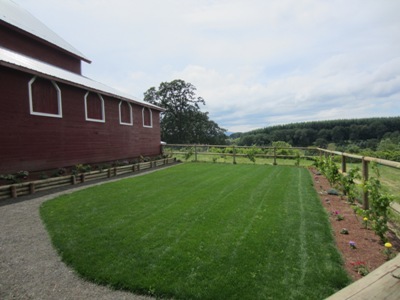 Grass courtyard area adjacent to the barn with stunning views overlooking the farm and valley. *$500 refundable deposit in order to hold a date is required. Built around 1880 the barn was designed to hold draft horses on the lower level with the top devoted to hay storage. Signs of these uses are still evident around the barn, things like the wear marks from horses chewing on the beams, the hitching ring for tying them up or the trolley track that was used to lift in hay. Constructed by master craftsman using only hand tools, the building utilizes mortise and tenon joints and very few nails. The farm has seen multiple owners and many ups and downs since it was built. It is a testament to the quality of its construction that it has come through all those years in such good condition.